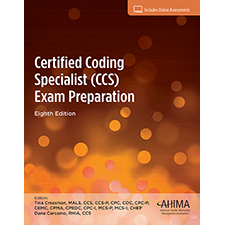 Combining in-depth study materials covering CPT, HCPCS Level II, ICD-10-CM and ICD-10-PCS content with comprehensive testing practice, Certified Coding Specialist (CCS) Exam Preparationprovides the added knowledge and test-taking skills to face the CCS certification exam with confidence. The practice exams, supplemental practice questions, case studies, and online assessments will help prepare you for the exam experience, providing opportunities to test your knowledge and skills. Copyright © 2019 by the American Health Information Management Association. All rights reserved.